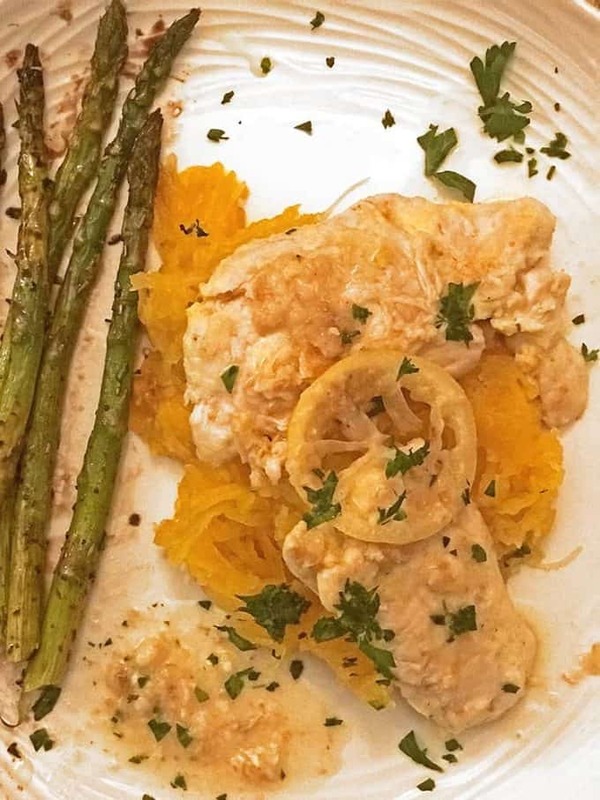 This Healthy Chicken Francese Recipe is our latest attempt at creating some delicious meals that are easy to make and easy on both your palate and your health, not to mention light on your waistline and pocketbook. 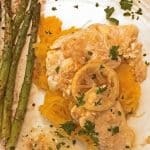 This healthy chicken francese recipe is erved with roasted asparagus. Fresh parsley and lemon give this healthy chicken recipe a nice flavor boost. 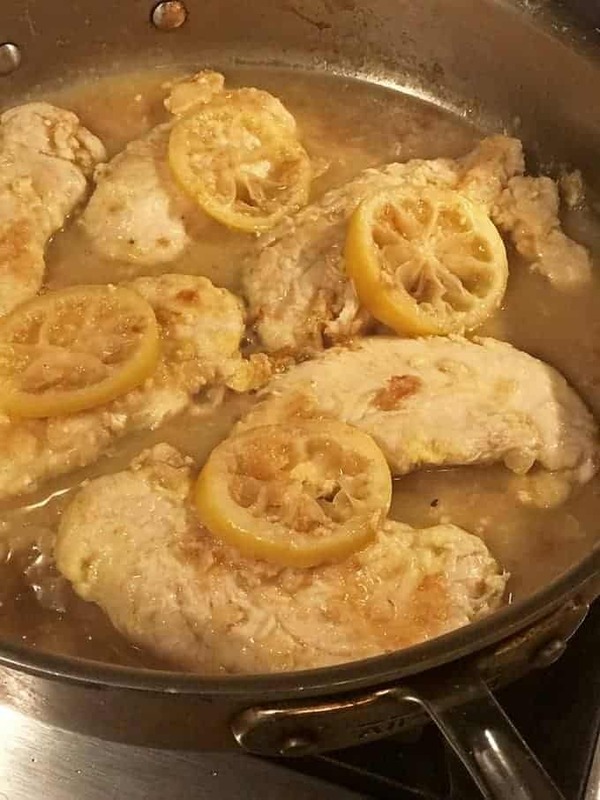 In our version of chicken francese there isn’t a drop of butter. 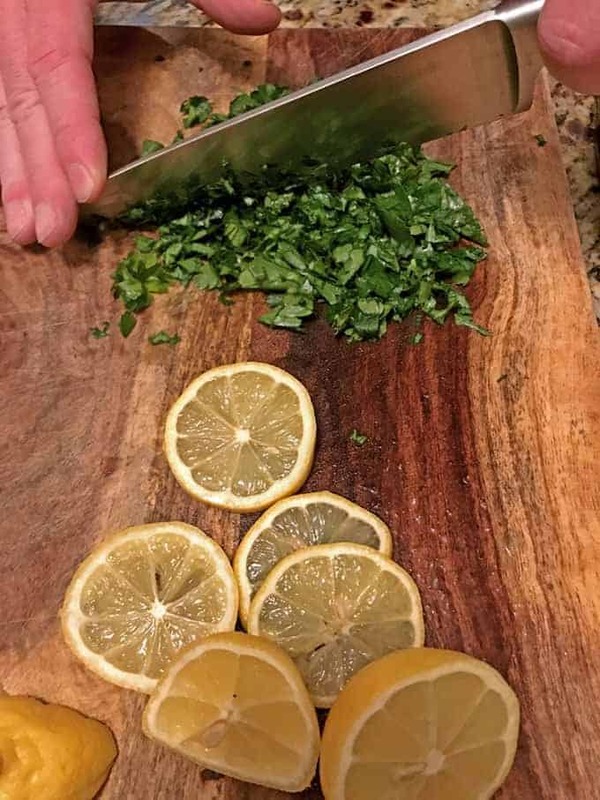 We chose to use fresh ingredients like lemon and Italian parsley. 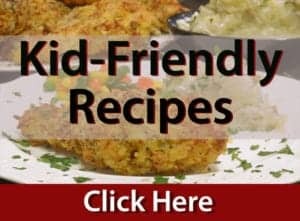 By doing this, the vibrant tastes of these fresh ingredients pave the way for a delicious and healthy meal for your whole family to enjoy. 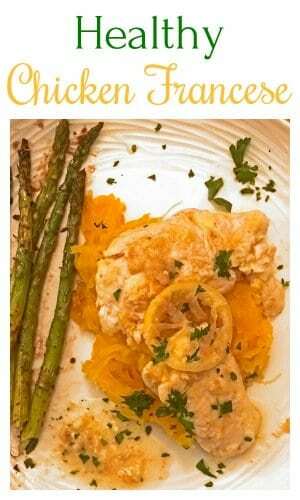 We put this healthy chicken francese recipe together very quickly during the work week. 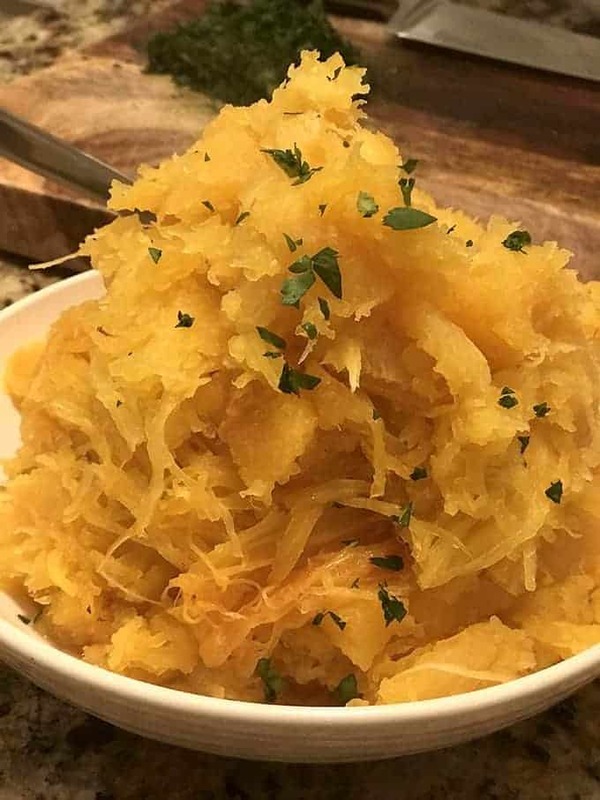 It is simple, fast and very tasty as well as a wonderful meal for just two, or for when you have company over. 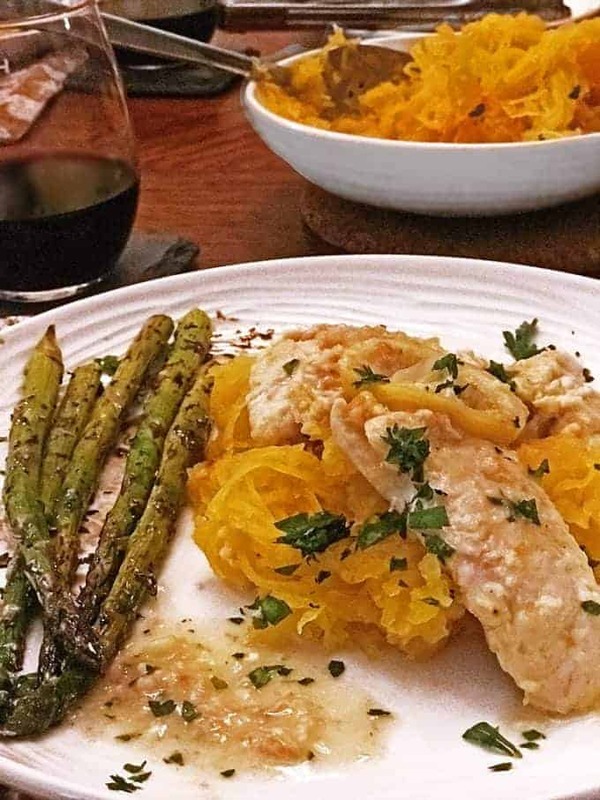 Spaghetti squash is a delicious base for this healthy chicken recipe. Franchese-Style make for one of the most flavorful light chicken recipes you can make. Eggs ares showing up all over these days, often with other healthy power foods. 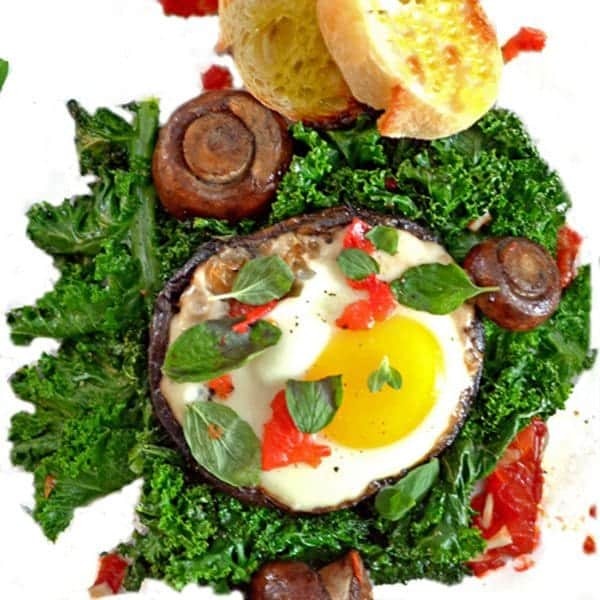 Take a look at our Baked Egg and Portabella with Braised Kale. This healthy chicken dinner can be ready in under 30 minutes. Place tenderloins between two layers of parchment paper and pound flat, using either the flat side of a meat mallet or a small cast iron skillet. Pound to a thickness of about 1/4 inch. In a medium size bowl, combine flour with salt and pepper. In a separate bowl combine egg substitute and egg. Mix well. Place a large skillet over medium high heat and add the olive oil. Dredge both sides of each tenderloin first in the flour mixture and then in the egg bowl making sure to coat thoroughly. 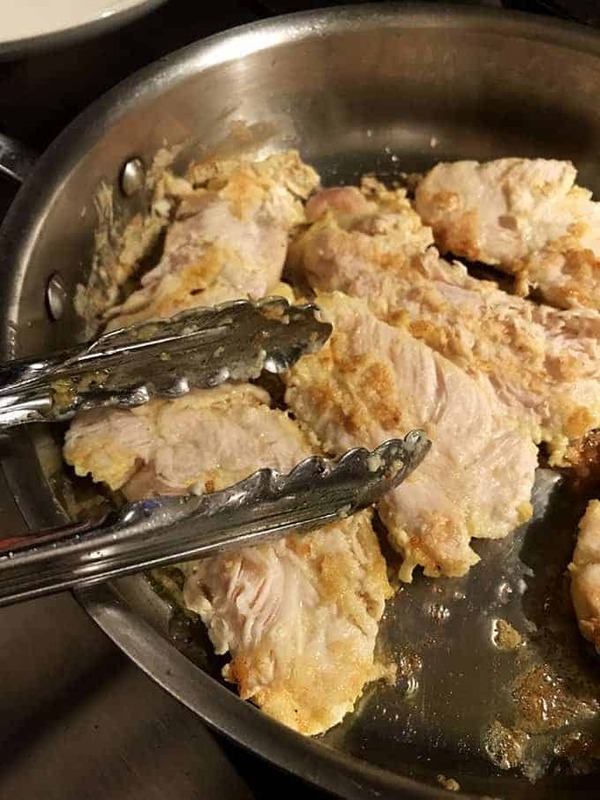 Once the oil is hot, place three of the tenderloin cutlets in the skillet and sauté on each side until golden brown. (Coat the top of each piece with a bit of olive oil before turning). Remove chicken to warm platter and tent with foil to keep warm. Repeat the process with remaining chicken. 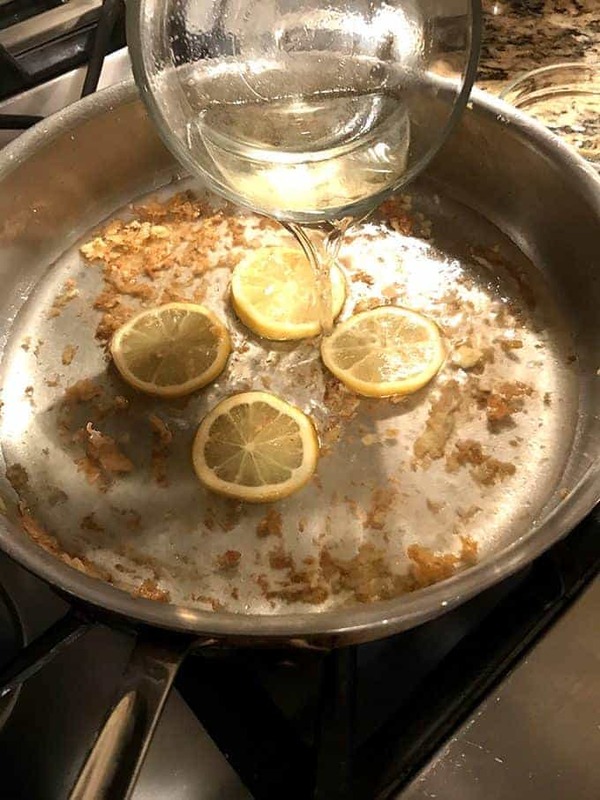 After all the chicken is sautéed and tented on a warm plate, place lemon slices into the same skillet and cook over medium high setting for 2 minutes. Add the broth, wine, and lemon juice and bring to a gentle boil to deglaze the pan. Reduce heat and cook until sauce is reduced. Sprinkle in flour and stir over heat, until slightly thickened. Return the chicken to the skillet with the sauce and top each tenderloin with lemon slices and simmer for a couple of minutes. Garnish with chopped parsley and serve. धन्यवाद and thank you, Ushmana. What an honor to receive your kind comments; thank you so much for the lovely feedback! 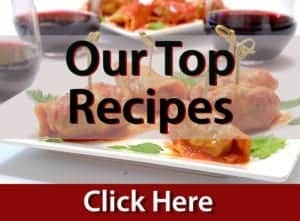 Delicious Dan and love love this recipe!! Thanks, Ladies. How nice to hear from you!